An interesting talk with Jonathan, author of "Seeds of Vision" and "Children of Rhatlan". Jonathan started out with an e-book publisher and has migrated over to conventional print via Crystal Dreams Publications. Give a listen to see what he has to say about the difference between "e" and print. 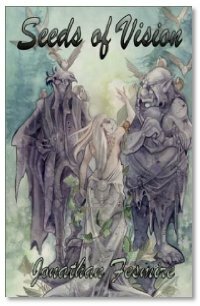 Drop by his website and read his original "Introduction to Fantasy" section for some sample works and some links to other interesting sites. He also reviews other works for PanGaia magazine, catering to the Pagan community. Bed music Loke E. Coyote "Pagan Zydeco" - From Cedar Park, Tx.